Who transformed George Washington’s demoralized troops at Valley Forge into a fighting force that defeated an empire? Who cracked Germany’s Enigma code and shortened World War II? Who successfully lobbied the US Congress to outlaw child labor? And who organized the 1963 March on Washington? Ls, Gs, Bs, and Ts, that’s who. Given today’s news, it would be easy to get the impression that the campaign for lesbian, gay, bisexual, and transgender (LGBT) equality is a recent development, but it is only the final act in a struggle that started more than a century ago. 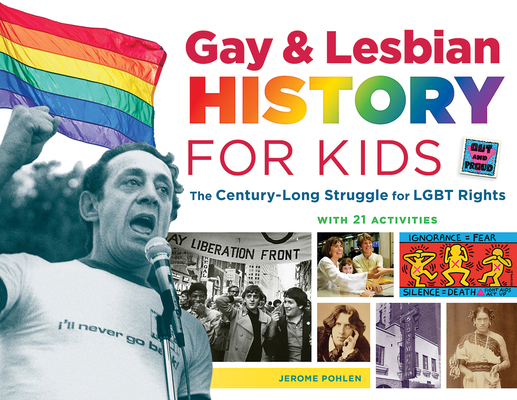 The history is told through personal stories and firsthand accounts of the movement’s key events, like the 1950s “Lavender Scare,” the Stonewall Inn uprising, and the AIDS crisis. Kids will learn about civil rights mavericks, like Dr. Magnus Hirschfeld, founder of the first gay rights organization; Phyllis Lyon and Del Martin, who turned the Daughters of Bilitis from a lesbian social club into a powerhouse for LGBT freedom; Christine Jorgensen, the nation’s first famous transgender; and Harvey Milk, the first out candidate to win a seat on the San Francisco Board of Supervisors. Also chronicled are the historic contributions of famous LGBT individuals, from General von Steuben and Alan Turing to Jane Addams and Bayard Rustin, among others. This up-to-date history includes the landmark Supreme Court decision making marriage equality the law of the land. Twenty-one activities enliven the history and demonstrate the spirited ways the LGBT community has pushed for positive social change. Kids can: write a free verse poem like Walt Whitman; learn “The Madison” line dance; remember a loved one with a quilt panel; perform a monologue from The Laramie Project; make up a song parody; and much more. Jerome Pohlen is a former elementary school science teacher, an engineer, an editor, and the author of Albert Einstein and Relativity for Kids, a 2013 VOYA Nonfiction Honor List title.